An amazing, hand-built stovetop roaster that will serve you well. Recommended for: Anyone, but the Huky will be especially attractive to those who value artistry and quality workmanship, in addition to pure function. Are you interested in home roasting, but don’t want to spend a fortune on a top-quality machine? Would you describe yourself as a committed Do-It-Yourselfer who likes to have total control over whatever it is you’re doing? Most importantly, do you place great value on artistry and craftsmanship, in addition to pure function? If you answered yes to any of those questions, then you’re going to love our in-depth look at the Huky 500 coffee roaster. 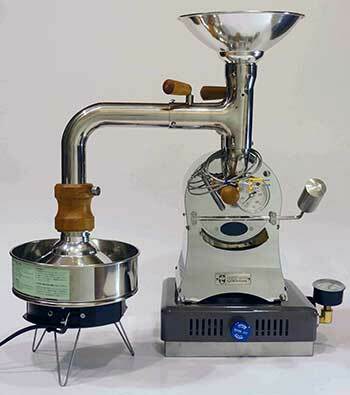 This brilliant machine is unlike any other home roaster on the market today. Hand built by Kuanho Li, in Taiwan, each machine is a one of a kind wonder that’s sure to impress, which gives you not just an incredible home roaster, but also a unique work of art to proudly display in your home kitchen. We’ll go over everything this machine can and can't do in the sections that follow, and we think you’ll agree, even if you opt to go in some other direction, it is flat-out amazing. As mentioned above, since the machine is hand-built, there will be some variance in overall dimensions, and some customization is allowed. That said, the machine’s baseline dimensions are 15.75” x 7.5” x. 13.8”, and it weighs in at 13.23 pounds. The Huky coffee roaster is an interesting machine to look at too. At first glance, it gives the impression of being a sci-fi prop from a 1960’s era movie. It’s “retro-futuristic,” which we like very much. While that might not be a perfect fit for every home kitchen, it’s sure to be a conversation starter and is not unattractive by any means. It’s also small and light enough that finding a permanent home for it shouldn’t be a problem, although understand that if you’re getting the gas version, you’ll be moving it to your stovetop or grill each time you want to use it, so be prepared to move it about on a regular basis (this won’t present much of a challenge either, given its light weight). Don’t think for a moment that just because the Huky is handmade that it sacrifices functionality – it doesn’t! This unusual looking machine can keep pace with every other professionally designed home roaster in its class, and offers a full range of capabilities, including automatic profile logging and tracking, courtesy of the included USB connection port! If you connect your laptop to it, you’ll be able to track each roast you do via Artisan Roast Profiling or similar software. Note that the base model of the machine is designed for use over a gas stove or grill, but you can also request an electric version of the machine if that’s your preference. Most serious roasters prefer gas, for the same reason that most serious chefs prefer cooking on a gas range versus an electric one, but it’s nice to have the electric option if you want it! On paper, the Huky roaster has a 500g capacity (1.1 pounds), although the primary seller, Crop To Cup, recommends a maximum batch size of 400g (14.1 ounces). You can certainly fill the roaster to its maximum, 500g capacity, but this is not recommended until you’ve gotten some level of mastery with its use. If you do, you’ll likely get somewhat inconsistent results. Note that you can also use it to roast test batches as small as 100g (3.5 ounces). This is comparable to the more expensive North 500g roaster and significantly better than the Hottop, which is a less expensive option, so from a capacity standpoint, it’s squarely in the middle of the pack, which isn’t a terrible place to be. You won’t find any presets with the Huky 500t, which is another reason why we recommend roasting a number of small test batches when you first get your machine. You’ll want to give yourself some time to practice using it. We also recommend connecting the roaster to your laptop while you’re running your test batches so you can start building a collection of roasting profiles. Then, once you get a batch that’s to your liking, it’ll be a simple matter to reproduce it and ramp up to full-scale production. The Huky does make an attempt to manage smoke, in that it comes with a vent hood that redirects it up. If you’re using it on your gas stovetop, and turn your range fan on high, this should mitigate the smoke problem fairly well. If you’re using it outside (say, on a gas grill), you should likewise have no real issue. Unfortunately, if you’re using a standalone stove with no range fan, Huky’s solution isn’t going to help you much, and you’re all but certain to set off any smoke detectors you’ve got nearby. If that’s the case, about the best you can do is open your kitchen windows, bring in a small box fan, and pull the batteries out of your nearby smoke detectors (remembering to put them back in when you’re done, of course). All in all, it’s a decent system, but depending on the particulars of your home kitchen, it may not be helpful, so be mindful of that. As with most machines in its class, using the Huky is a simple, straightforward affair, but mastering it will take time, practice, and patience. Just be patient with yourself here. As we mentioned earlier, start small, roasting a few 100g test batches to get a feel for the machine’s basic use. Build a few roasting profiles, and as always, let your eyes and ears guide you. Don’t be surprised if your first few test batches don’t turn out quite the way you had hoped, but if you stick with it, you will get there! If the Huky has a downside, it is the fact that there’s really not much in the way of chaff management. After each batch has cooled, you’ll want to pour your freshly roasted beans into a colander to do some sifting before you store them for later use. A good rule of thumb is that you have to clean your Huky 500 t roaster after every fifth roast, but remember that this is just a general guideline. How frequently the machine will actually need to be cleaned is primarily a function of how dark you like to roast your beans. The darker the roast, the more often you’ll need to clean the machine. Just let your eyes be your guide here, and when the machine looks like it could use a good cleaning, give it one. Note: You’ll probably also want to get in the habit of cleaning the machine any time you switch to a different kind of bean. It’s handmade. Each machine is a one of a kind creation and a work of art. Basically, it’s a robust, capable home roasting machine that, with practice, can give you results comparable to what you’d get with a much more expensive machine. The exhaust hood is good at redirecting smoke, but may not be effective for all home kitchen setups. And no real effort has been made at chaff management, which means that with every batch, you’ll have an extra step to do. Neither of these are deal breakers but are both things you should be aware of before making a purchase decision. 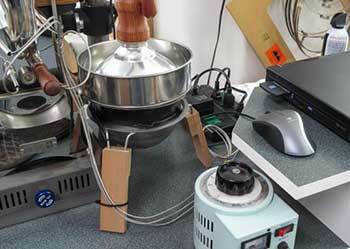 And that wraps up our review of the Huky 500 coffee roaster. It’s an impressive machine, by any reckoning, and we highly recommend it for most home roasters. Yes, it will take time and practice to learn to use it well, but that’s true of most anything. Mastering its use is easier than you might think because the Huky has a large, and loyal fan following. Help and advice is literally just a few mouse clicks away, any time you need it. The thing we like best though, is the fact that you’re getting more than “just” a solid, high-quality home roasting machine. You’re getting a custom-built work of art, and in our view, that makes the Huky one of the best values on the market today. 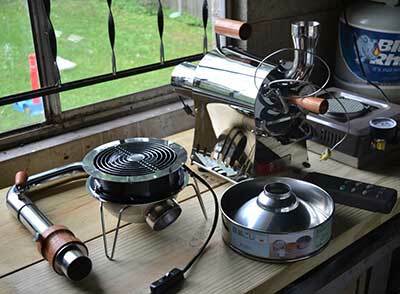 Are you interested in home roasting, but don’t want to spend a fortune on a top-quality machine? Would you describe yourself as a committed Do-It-Yourselfer who likes to have total control over whatever it is you’re doing? Most importantly, do you place great value on artistry and craftsmanship, in addition to pure function? These brilliant machines are unlike any other home roaster on the market today. Hand built by Kuanho Li, in Taiwan, each machine is a one of a kind wonder that’s sure to impress, which gives you not just an incredibly home roaster, but also a unique work of art to proudly display in your home kitchen. We’ll go over everything this machine can do in the sections that follow, and we think you’ll agree; even if you opt to go in some other direction, these are flat-out amazing. As mentioned above, since these are all hand-built, there will be some variance in overall dimensions, and some customization is allowed. That said, the machine’s baseline dimensions are 15.75” x 7.5” x. 13.8”, and it weighs in at 13.23 pounds. It’s also small enough and light enough that finding a permanent home for it shouldn’t be a problem, although understand that if you’re getting the gas version, you’ll be moving it to your stovetop or grill each time you want to use it, so be prepared to move it about on a regular basis (this won’t present much of a challenge either, given its light weight). You won’t find any presets with the Huky 500t, which is another reason we recommend roasting a number of small test batches when you first get your machine. You’ll want to give yourself some time to practice using it. If the Huky has a downside, it is the fact that there’s really not much in the way of chaff management, so after each batch has cooled, you’ll want to pour your freshly roasted beans into a colander to do some sifting before you store them for later use. A good rule of thumb is that you’ll want to clean your Huky 500 t roaster after every fifth roast, but remember that this is just a general guideline. How frequently the machine will actually need to be cleaned is primarily a function of how dark you like to roast your beans. The darker the roast, the more often you’ll need to clean the machine. Just let your eyes be your guide here, and when the machine looks like it could use a good cleaning, give it one. Note: You’ll probably also want to get in the habit of cleaning the machine any time you switch to a different kind of bean. • It’s handmade. Each machine is a one of a kind creation and a work of art. • The exhaust hood is good at redirecting smoke, but may not be effective for all home kitchen setups. 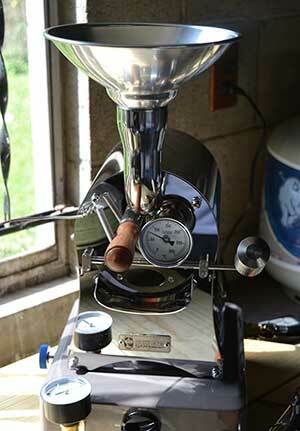 And that wraps up our look at the Huky 500 coffee roaster. It’s an impressive machine, by any reckoning, and we highly recommend it for most any home roaster. Yes, it will take time and practice to learn to use it well, but that’s true of most anything. How to Roast Your Own Coffee. Precision Nutrition. Health Benefits of Coffee. Green Bean Roasters. ​Importance of Freshly Roasted Beans for Taste and Flavor​​​. Cooks Illustrated. The Effect of Bean Origin and Temperature on Grinding Roasted Coffee. Nature Research.